July 4, 1976. It was our nation’s Bicentennial celebration. The Spirit of ’76. I will never forget where I was, who I was with, or what I did. It was the best Fourth of July ever. 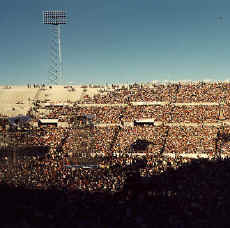 On that day, along with 60,000 other fans, I got to see Elton John perform in concert at Schaefer Stadium in Foxboro, Massachusetts. The concert was as historical as the date. At 17, I had been an Elton John fan my whole teen life. I’d seen him in concert twice before, in 1972 at the Boston Music Hall and in 1974 at the Boston Garden. I had founded an Elton John Fan Club called SNAFF (Saturday Night’s Alright for Fighting), and designed a T-shirt with Elton’s birth name Reggie Dwight emblazoned on the front. Yes, I put the “fan” in “fanatic.” When Elton’s albums came out, I bought them, when they came out as 8 Track cartridges (Yes, freakin’ 8 Tracks) I bought them too, and then I bought the cassettes and DVDs. Elton’s a billionaire because of the likes of me. So there was no way I was going to miss this concert. Here it was our nation’s 200th birthday and on the most important day of the year, my hero was going to be right in my backyard, to be specific just 20 miles from my hometown of West Bridgewater, Mass. I snagged a pair of tickets to go with my boyfriend Mark. I was a senior in high school, he was a year younger. We had only been dating a few months and had a passion for Monty Python. My friend Paula was going to the concert too and said her father could drive us. We got to the stadium around 11 a.m., and didn’t leave till midnight. Paula’s dad waited for us outside the whole time. He was a saint and I never really thanked him properly. So thank you Mr. LeMasa, you are a great dad! Our tickets were general admission, not for specific seats, so we plunked ourselves down on the football field all day. This was back in the day before crowd control measures were implemented. The field was PACKED. Mark and I went through all the Monty Python routines we knew and canoodled a little a bit throughout the day, which in hindsight was probably a bit rude to Paula. But we were teens and there was nothing much to do. This predated the cell phone era. The concert started with opening act John Miles. As he started to sing I realized we were really far back from the stage. I looked at Mark with a sad face. All this time, all this waiting, and Elton was only going to be a tiny whir of a dot. “You want to get closer?” he said. Well of course I did but there were too many people on the field. It was a mob scene. “C’mon, we’re going,” he said and grabbed my hand. I grabbed Paula’s and like a bull, Mark stormed through that crowd, pushing people aside until we got to the very front of the stage. Unbelievably rude, but I was too happy to complain. Then Elton arrived. What an entrance. 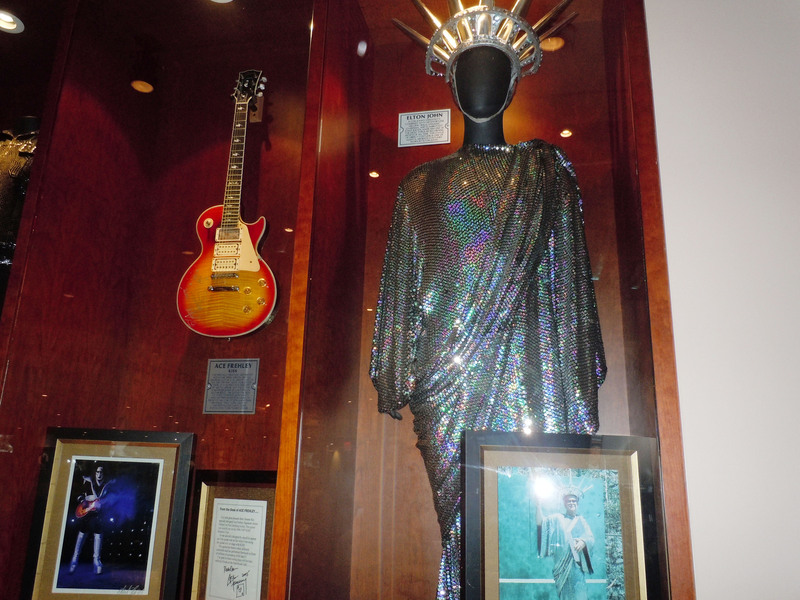 A helicopter touched down in the stadium and Elton hopped out dressed like the Statue of Liberty. He pounced across the stage in shimmering silver sequins with fireworks spouting from his crown. Two words — rapt amazement. I was so close I could reach out and touch his costume, if I dared, which I didn’t. The concert was incredibly fun and exciting. It was part of the Louder than the Concorde But Not Quite As Pretty Tour. Elton hit most of my favorites that night — Goodbye Yellow Brick Road, Funeral For A Friend/Love Lies Bleeding, Benny and the Jets. I sang every song with him. Mark stood behind me, held me, swaying. The crowd went wild as he finished with three finales, Saturday Night’s Alright for Fighting, Your Song, and Pinball Wizard. After that summer I went off to college, Mark went back to high school and we never saw each other again. But I’m never going to forget that he was that guy that made that night so special, getting me so close to my idol. Mark, thanks for the best Fourth of July ever. NOTE: Preparing this blog post I dug out some of my Elton memorabilia. I have the souvenir program from that night. It’s a bit tattered but I’ve held onto it for almost 40 years along with the program from his 1974 tour. Davey Johnstone – Electric guitars, banjo, mandolin, rhythm guitar, background vocals, slide guitar. 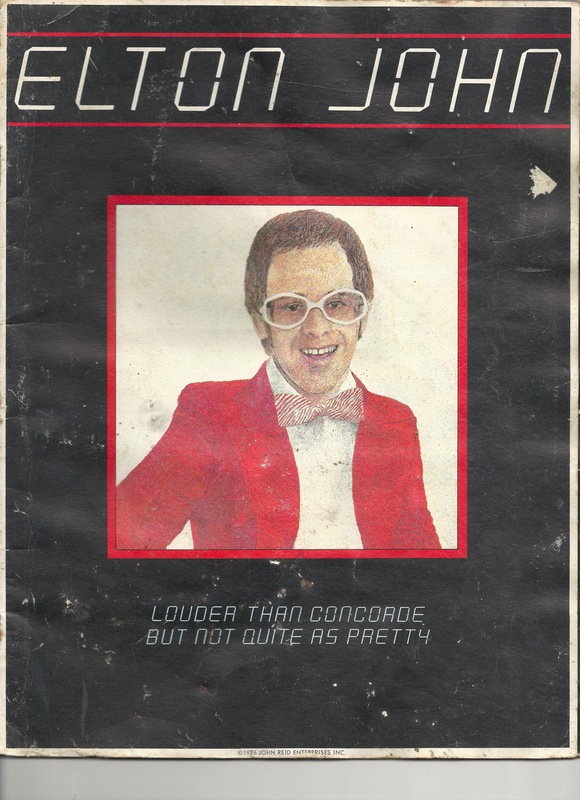 Elton John and his Louder Than the Concorde band. 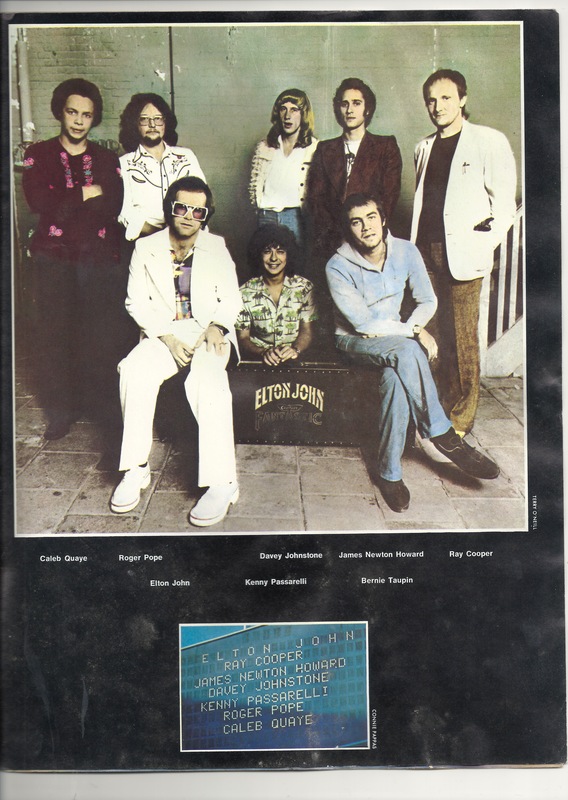 Program from Elton John’s 1976 tour. 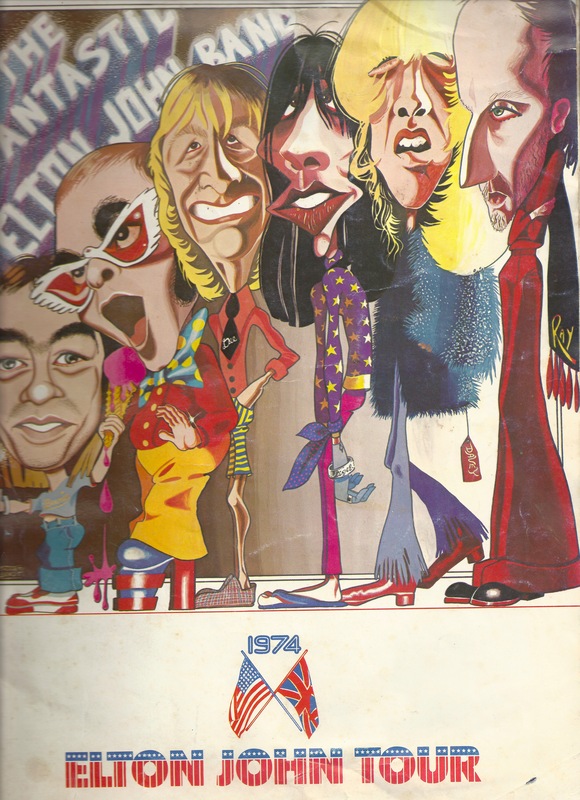 My favorite Elton John program, from the 1974 tour featuring brilliant art by Jacques Benoit. I went to this concert too… summer right before my senior year. We drove up from Newport and to this day this is one of the best concerts I’ve ever been to. Elton’s entrance being dropped from the helicopter was spectacular. We had gen adm. tickets too so spent a lot of the time roaming around trying to get closer to the stage. Wow… what a summer and what a night. I think I’ll remember it until the day I die. So cool to hear from another person who went to this concert! I’ve been to a number of Elton John concerts over the years, but this one can’t be matched for its electricity and excitement! I’ll never forget it either. We got something special. Thanks so much for your comments! Too bad you haven’t been able to see him in Jacksonville, and yes his concert tickets are very expensive. That’s one reason I feel somewhat responsible for making him a gazillionaire. I’m also somewhat amazed (and also quite pleased ) at how well he’s been able to attract new audiences. By crossing over with Broadway scores such as The Lion King, the younger generation loves Elton too. Attending a concert along with parents with small kids is pretty unexpected, but cool nonetheless. After all these years, this is the one concert I will always remember and be so happy I went to. 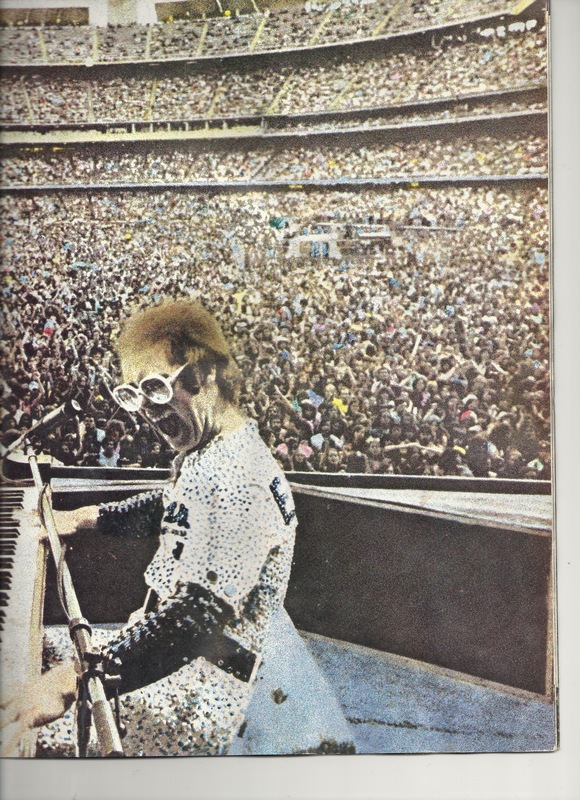 God love the schedulers who brought Elton to Foxboro, Massachusetts on July 4, 1976!!! We were the lucky ones! I was there also! I was lucky enough to get backstage as I was a huge fan and my dad was on security for the show. Although I didn’t get to meet him, the 12” lucite platforms with goldfish in them that he had on backstage were amazing. Wow, that’s pretty amazing! What a great experience! Your story was so similar to my own. I bought the tickets for my boyfriend for his 18 th birthday. Best concert of my life. I remember fireworks too. I swear they did one that looked like Elton John, is that possible. Thanks for bringing back the memories. Lived down in Marshfield and went with my older brother as the rest of my family headed to the Esplanade for the Pops Bicentennial Concert. I still remember the chants at the gate in the morning as we shouted “1,2,3,4, open up the f**ing door. 5,6,7,8 open up the f**ing gate. I was all of 10 years old and we were able to get within about 25 yards of the stage. I couldn’t see when Elton took the stage and everyone stood up, so I ended up walking up to the stands by myself so I could see. I waited until I was about 30 to tell my Mom that part of the day. What an amazing concert. That’s a funny story! When we got there, the gates were already open, so no yelling. I’m sure the Pops were glimmering that year, but what we got was ELECTRIC!!! Thanks for the link to your site Rich! It’s Elton-licious!!! I first saw Elton on Nov. 20 1974 at Boston Garden and had been listening to him from the beginning in 1970. When I saw him on July 4 1976 in Foxboro it was just amazing, the day, the concert, it was special you know? My old best friend and I spent the whole day there. The tickets were 8.50. It is a splendid life. I had no idea at the time, but looking back, it was the best of times. I was there too. 16 years old and the first concert I went to. Yes, it was one of the best! Had great seats on the right side. Rick Derringer, Dave Mason were great too. M8’s blowing up all around us was a little scary, but I’ll never forget that show. No ride home and had to walk all the way home to No Attleboro. Got home around 3 AM. Seen him a few times since and all were good, but not as electric as that 4th of July night. Wow, now that’s being a FAN! And I agree with you Matt. That night was electric. I’ve never been to a more exciting concert! Thanks for sharing. I was a 17 yr old, rabid Elton John fan. On July 4, 1976, my cousins came to my house in Quincy. My uncle surprised us with tickets for the boys to go to the Sox game and 2 tickets for me and his daughter to see Elton John. I was beside myself. We enjoyed John Miles & Dave Mason from the far end of the field. When Elton John arrived, my cousin grabbed my hand & started running. No one seemed to mind us snaking through the crowd. We ended up close to the stage. A little while later, 2 complete strangers grabbed us and put us on their shoulders. Insanely amazing vantage point. Awesome concert. It was an extraordinary experience that I’ll never forget. So much fun Anna! As the fourth of July approaches this year, how I would so love to see Elton John again in a concert like that one! I was there too! My cousin worked at WCOD and some guy called in looking to sell his tickets so my cousin called me. Hell yes I want those tickets! My girlfriend and I hopped in her car, ran and got the tickets and drove there from Hyannis. What a show! What a windfall for you Cathi! In all my years, I can’t think of a better concert experience than that one. As I just turned 20 & secured 2 tickets to this show, little did I know it would be something I would never forget ! Attending Northeastern University @ the time my (girl) friend & I caught a bus @ the Boston Commons for the trip to Foxboro. We arrived in the early afternoon & went in as soon as the gates opened. We got good seats stage left about 3 rows back from the access path on the lower stadium level. Was blown away with John Miles & Dave Mason’s performance. We were ready to leave then & call it a night. But then on the horizon a helicopter circled the stadium 3 times. Elton’s gold rimed glasses were easily seen in his seat as he watched the crowd’a reaction. The wind & effects of Funeral for a Friend opened what was the shortest 2 and 1/2 hour concert I ever saw. Leaving the field & on the bus back to Boston my ears were ringing attempting to replay what we just saw. We arrived well after 2AM in town & Pati lived on campus. I had to get home in Cambridge. Most folks know the T stops running @ 1AM. So not having money for a cab … I walked home. Strolling across the Massachusetts Ave. bridge repeating the lyrics to Holiday Inn. Some 38 years later, still remember this 4Th …… Thanks for the pix Pat !! Such a great Fourth of July. We’ll always have these wonderful memories. Thanks for sharing your story Peter! It was the best years of my life, it was also the year my first baby was born to me and i will forever love her so much,even though I didn’t get 1cheeseburger 1 piece of barbeque chicken. i had my first born Tyeasha R. Rivers Terry, yes it was a beautiful day that I’ll never forget. ALL PRAISE DUE TO ALLAH. ALLAH AKBAR !!! My heart was pounding like i stole something but I got in!! I couldn’t believe it! I was just a skinny little guy and got myself 5 feet from the stage, it was horrible to be sandwiched there alone, but it was where i needed to be. I saw the sign light up all sparkles to outline Elton’s face at his keyboard just behind stage…. A few moments later his helicopter hovered above to right of stadium , it was absolute pandamonium inside as we all waited, you couldn’t think it was that crazy! 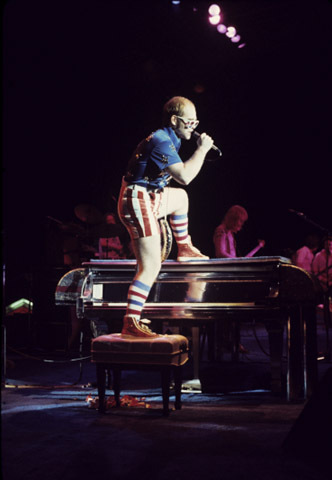 He came out , and his piano was unveiled, sparkly red,white and blue , I’ve never seen anything like it, black puffy leather seat in front, and Elton wearing red,white and blue lensed glasses, matching shorts and tank top. At some point during his set he had this water bag type thing that he started to squirt out into the fans up front, swinging it around then letting it go flying into the crowd. I can remember every second of that night, it was meant to happen for me and all those Lucky enough to have been there. Elton John has always been number one for me, it’s really sad that cell phones weren’t around then because the whole night could’ve been recorded. I am so grateful to dad (RIP),his friend and the $10 scalper for the memories we all have of July 4, 1976…….Wow, 39 yrs ago this summer! Mike T from D’st south Boston. What a wonderful memory Mike! $10 ticket to see one of the most memorable concerts of a lifetime. Best Deal EVER! Just found this and wanted to leave my memories. I ” discovered ” Elton in 1973 after hearing Bennie and the Jets for the first time. I was consumed by him and his music. I bought everything of his that I could get. Well , three years later I finally got my chance to see him. I was 16 years old and got tickets for me and 4 other friends. They were $10 apiece.We all piled into my friends older brothers car and left at 4 a.m. for the drive from Endicott,NY to Rich Stadium in Buffalo,NY. It was all general admission and we wanted to make sure we got there in time. We had alot of fun on the way and were excited not knowing what we were about to see.This was the first concert of my life and to see my idol in person was unbelievable. Outside the stadium it was like a carnival. There were vendors and people trying to sell t-shirts and programs. When they finally opened the gates to let us in it was like a stampede with everyone running to the football field to try to get up close. We on the other hand took seats on the side at about the 40 yard line and waited for the show to start. Originally it was supposed to be Dave Mason that opened the show but it ended up being John Miles that came on about 12 noon. He was really good and years later I read that Elton was a little upset because John was so good. But that made it even better for us because I think Elton had to make sure he kicked it up a notch to make sure everyone knew who the headliner was. Now the anticipation was really growing because Elton was next.It really didn’t matter that right before he came on it started raining and never stooped. I was never so happy to be drenched. You could hear the guitars and his piano being checked behind the curtain to make sure they were tuned and ready. Then you heard someone count it off and they played ”Grow Some Funk of Your Own ” as the staged came from behind the curtain and moved to the front.The crowd roared and went wild. But where was Elton? When the moment was right he ran onto the stage and jumped on his red , white and blue glittered piano.He had so much energy and was all over the stage when he could. But to see him for real for the first time was unbelievable. Back then there wasn’t any MTV where you could see the artists all the time.All you had was maybe a picture in a rock magazine.He was truly a living legend. I was mezmorized. I have seen him quite a few times since that 1976 show. Most notably 1982. I saw him every night he played at the Hollywood Bowl on his Jump Up tour.The first night I was there I had seats in front of him in the second row and almost said hello to Bernie Taupin who was there but I was tongue-tied. While the 1976 tour was his best that I’ve seen I think his 1982 tour had his best song set. To hear songs like ”Where To Now St. Peter”, ”Ticking”, ”Empty Garden”,”Teacher I Need You”,and so many others when his voice was still perfect I will never forget. I have pictures of the show which I can look at to help remind me what a crazy day it was. They can be seen in a book called ”It’s a Little Bit Funny” in which photographer David Nutter followed Elton on his 1976 tour taking pictures. I graduated from high school in 1976 and went to the concert with one of our teachers!! LOL She had a brand new ’76 Monte Carlo. I was so exciting driving down to Foxboro sipping a few Michelobs hahahaha. Whenever Elton made his grand entrance flying in and coming out like the Statue of Liberty everyone went wild!! What a day and night………………..we met so many cool fans too. We were so lucky weren’t we? One of the best events of my life! I was there too! It was the FIRST concert I ever went to. I was 14 years old and my best friend’s dad took a troupe of us teenage girls (brave man). It was amazing, especially considering it was the first concert I ever went to. What an incredible experience and memory to have forever! I was there too-drove from Pittsfield MA. in my 1968 Dodge Charger. Got there around 11 AM and arrived back in Pittsfield around 4 AM the next day. It was my first Elton and one that I still speak of to this day. Great concert for sure. Wish there was a video out there of the concert. How wonderful hearing from so many people who went to that concert. It was something we’ll never forget! Hi to all of the true Elton fans who were there on July 4 1976, along with all the other great concerts he performed in those years. This is my 2nd post , to give pause and reflect on how great and rather simple it was to enjoy things then. We all have a duty to ourselves as Americans to unite and defend our freedoms from those who seek to impose on our constitution, whether they be foreign or domestic, we must defend. Which Elton song comes to mind today folks ? This is the time of Revelation , today people, not later on. We all celebrated our Constitution on that wonderful day 40 years ago, but now is the absolute time to take action to defend it and everything it stands for. Peace to all Americans, to the americans who do not kill their own for political gain.. to those who live and love openly. To those who don’t hide and conspire. To those who love music . And most importantly to those who love children. We, as a people must unite to save the children !! God, bless us, for we know not if its dark outside or light. I brag to this day about this concert…It was my first one. I was ten years old and at first, my parents brought me and my older brother there just to listen outside the fence because we were huge EJ fans (thanks to our parents). Well, it turned out to be one of my greatest memories. One of the guards watched us outside the fence for about 15 minutes or so and then he opened the gate and let us in for free. I saw most of the concert and I’ll never forget it. That is so cool!!! What a nice guard!!! I think that was one of those concerts none of us will ever forget. And Elton was on his A game. What a good time! We are the lucky ones! A little late to the party with this. Do you remember Billy Jean King swinging a large Italian pepper between here legs doing Philadelphia Freedom? Also 24 ounce beers? I remember my brother lighting one of those when the lights went out and people held up lighters. Also went to November 1974 at the Garden. I remember myself and two other guys skipping school to go into the Garden to wait for tickets. I think they gave us wristbands and the entire stadium section was filled with people waiting for tickets. Harry Sinden of the Bruins walked across the ice and got a great ovation. I remember asking this girl in my homeroom that I’d always liked but never dated (she had a boyfriend) to go and she said yes. I got the nicest least expected kiss goodnight. We had nice loge seats facing the stage I think they cost $16. Back then he liked to throw piano benches. There are some things we’ll just never forget. For some of us, this was one them. Welcome aboard David! Thank you Patricia for this memory! I was there too, and shared your experience to my Music and Record Sharing with Ron Oliveri page on facebook…I posted my 74 program also…I was from Brockton…so glad to share your article on my page! I was there and its still my favorite concert. It happened between my sophomore and junior year and UMaine when I was living and working in Portland. I had stopped by a friends house a few days prior and he mentioned he had an extra ticket to the show if I was interested…hell yeah! He was a fave and I had Yellow Brick Road on vinyl and cassette. We sat in the stands to the right of the stage and watched the copter land at the dog track. The show was scheduled to start at 9PM and after the stage was cleared prior nothing seemed to be happening for set up. When that stage rolled out and the Statue of Liberty stood on the piano we all just looked at each other…then Elton jumped off and Grow Some Funk of Your Own cranked! Amazing show and memories are still so vivid. We waited in the parking lot for a few hours talking with people, waiting for traffic to thin. Got home around 6AM knowing I had been a part of something big. Amazing isn’t it how this one concert has impacted so many people. Like you, this event was the thrill of a lifetime for me as well. And after all these years, its sheer electricity has never been beat. We are the lucky ones. Thank you for sharing your story. I have been a huge fan of Elton and his band members on that tour, in fact I just received a Hawaiian shirt from Sue Pope, (wife of the late great drummer Roger Pope) it was one of Rogers favorite shirt. There is a memorial page on Facebook for Roger, FYI. Thanks again for your story! I was there too ! Age 17. What I remember most was the frenzy in the stadium waiting for his arrival and when he came out in a Statue of Liberty costume, the crowd went wild, then the music just kept it all going all night long. Fantastic ! Such an electric experience! So glad to share this with you and others who were there!